This premium Party tap consists of 3/8 line adapted to 2 meters of 3/16 line and then back to 3/8 Line with a simple thumb operated tap. The combination of the different sized lines means that you eliminate most of the foaming whilst dispensing your beer. 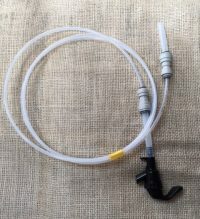 Just add adapter and disconnect to allow for attachment to your keg.